When the immune system of the human body attacks its own organs, the disease is called an autoimmune disorder, or disease. There are many types of these disorders, and one of the most common, is Graves’ Disease. This is the result of the immune system attacking the thyroid gland, a butterfly-shaped organ at the base of the neck, that helps modulate many bodily functions, through the production of the thyroid hormone. Graves’ was first described in the mid-1800s by Dublin physician Matthew Graves, who treated women with heart palpitations and enlarged thyroid glands. When the thyroid gland produces too much of the thyroid hormone, anxiety, distracted attention, nervousness, irritability, heat intolerance, and difficulty sleeping can result. Gradually, the Graves’ disease patient can become fatigued, experiencing a rapid or irregular heartbeat, have increased perspiration, weight loss despite normal food intake, brittle hair, frequent bowel movements, and in women, light menstrual periods. In some cases, the tissue and muscles behind the eye swells, making them bulge. The skin near the ankles may also develop a rash. There are many concerns about Graves’. One of the most serious is a rapid or irregular heartbeat. If not cared for, there can be some serious damage to the heart muscle. Both men and women can get this disease, but Graves’ occurs ten times more often in women than in men. Also, research has discovered that Graves’ most often begins in the 20’s and 30’s – during childbearing years. There is often a genetic component as well. Those who acquire Graves’ often have family members who have other autoimmune diseases, like Rheumatoid Arthritis, Vitilago, Addison’s Disease, Type 1 Diabetes and Pernicious Anemia, and Lupus. Medical researchers do not have absolute certainty as to which factors precipitate the immune system to attack the thyroid gland. But other risks, like recent illness, infection, or stress, are linked with developing Graves’ disease. If a thyroid issue is suspected, blood tests are usually performed to determine levels of thyroid-stimulating hormone (TSH) and thyroxin, one of the circulating thyroid hormones. TSH, produced by the pituitary gland, is the hormone that normally stimulates the thyroid. In Graves’ Disease, abnormal antibodies are present in the blood, which are detectable and mimic the actions of TSH, causing elevated thyroxin, even while natural TSH levels remain low. 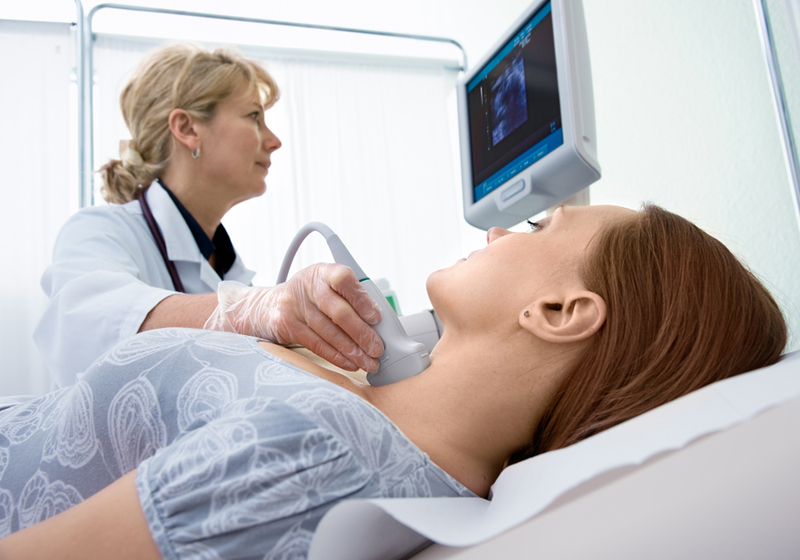 A radioactive thyroid exam can also be done to assess thyroid function. 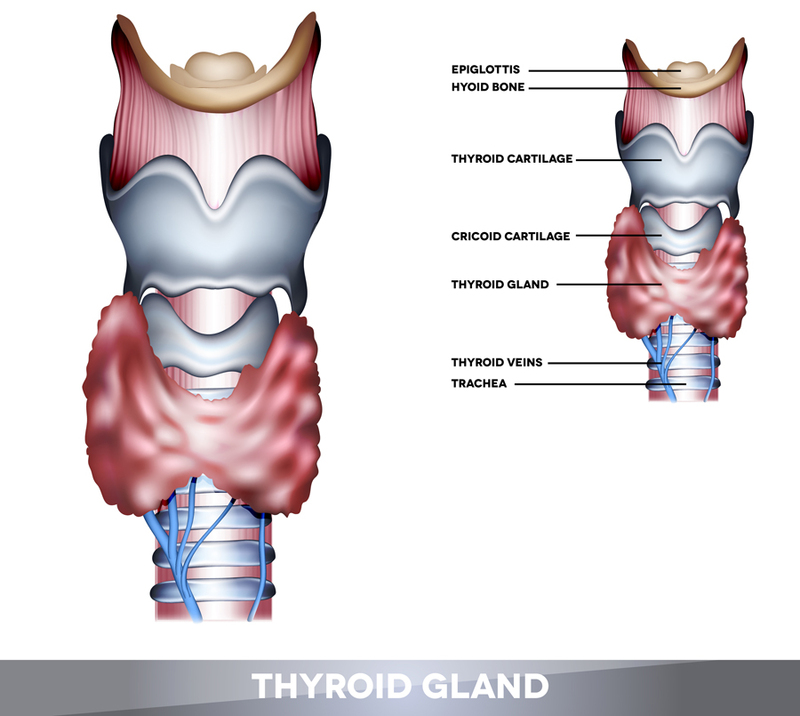 The body needs iodine to make thyroid hormone; and by ingesting a small amount of radio labeled iodine, then later measuring how much of it is taken into the thyroid, a doctor can see how well the gland is producing. High iodine uptake indicates that the thyroid is making too much hormone, as is the case in Graves’ Disease. In the U.S., an overactive thyroid is initially treated with radioactive iodine taken orally (as a capsule or drink.) The radiation helps to shrink the gland and permanently reduce its hormone output within three to six months. Radioactive iodine rarely has side effects, and the entire radioactivity is eliminated in the urine within two to three days. Sometimes anti-thyroid drugs may be given initially to reduce hormone levels; in about a third of cases, taking these medications for a year or more can produce a long-term remission. Graves often occurs in the 20’s and 30’s, peak childbearing years for women. As many as 30% of women who get Graves’ disease have been pregnant in the 12 months prior to the onset of symptoms. This suggests that pregnancy might be a Graves’ disease trigger for some women. It is also one of the reasons why it is important to understand the challenges that Graves’ Disease brings to those who are pregnant or wish to become pregnant. Pregnancy places stress on a woman’s body. Normal hormonal changes during pregnancy allow thyroid hormone levels to increase; such changes don’t adversely affect the pregnancy or the fetus. But untreated thyroid problems can cause the pregnancy to become hazardous. 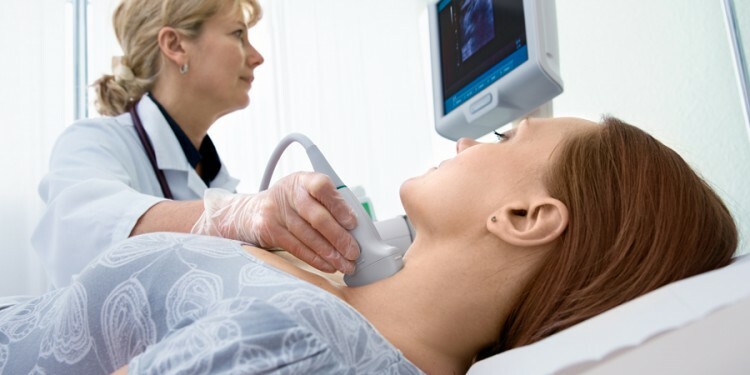 If a pregnant woman has symptoms of an overactive thyroid or notices a goiter, or swelling at the base of the neck produced by an enlarged thyroid gland, it is important that her doctor be contacted immediately. However, the good news is that Graves’ Disease rarely commences during pregnancy. The research shows that most women who have been diagnosed with Graves’ Disease had symptoms before getting pregnant. Even though these consequences seem scary, it is also important to know that Graves’ Disease is usually well managed during a pregnancy. During this time, the pregnant woman must have access to her OB/GYN as well as her endocrinologist, the specialist who treats those with hormone issues. Pregnancy sometimes creates changes in hormones that affect the thyroid, and these problems can affect the growing fetus. For some, in the first trimester the thyroid symptoms worsen, but as the body adjusts to pregnancy, the symptoms often improve. There is no known, reliable treatment to stop the immune system from producing the antibodies that cause Graves’ disease. So, the general medical approach is a solid one: medication that is effective in slowing down production of thyroid hormone or blocking its action. However, along with the medical approach are many case studies that suggest dietary and lifestyle treatments, offer some benefit in addressing autoimmunity, mainly because of the relationship between stress and autoimmune issues. The general thinking, backed by substantive research is that stress sets off a chain reaction in the body that includes the release of the hormone cortisol that helps handle stressful situations. Cortisol also helps regulate immune responses. In small doses, the body’s reaction to stress is protective; higher or unrelenting amounts of stress have the opposite effect. Researchers found, using mice, that exposure to high levels of corticosterone (the equivalent of cortisol in rodents) simulating chronic stress reduced the number of immune cells. This increased the number of cells that encouraged damaging inflammation compared to those that inhibit it. This mechanism appeared more pronounced in females than in males and may explain, in part, the higher rates of autoimmune disease in women than in men. It also supports previous research that found that a high proportion (up to 80%) of patients with autoimmune disorders reported uncommon emotional stress before disease onset. Thus, and unfortunately, not only does stress cause disease, but the disease itself also causes significant stress in the patients, creating a vicious cycle. When stress becomes such a malevolent factor in the life of a patient, there are three lifestyle changes that are often suggested, in addition to the medical protocols, that help manage this factor. First, is exercise. Walking even ½ hour a day, or swimming three times a week, helps with stress. The next lifestyle change that has helped Graves’ patients is dietary – by replacing animal protein as much as possible with plant protein. And the third deals with mind-body strategies, that can help with lessening stressful reactions: Yoga, meditation, guided imagery and even hypnosis. Finally, Dr. Gary Conrad, an integrative medicine professional, has written an excellent article published in the November/December, 2007, issue of Explore magazine entitled: Spontaneous Remission of Graves’ Disease: A Spiritual Odyssey. Dr. Conrad recommends the use of a multisystem, integrative approach that encompasses “all healing modalities” most appropriate to address an individual’s needs. One key component to his healing was learning how to optimize the mind-body connection to achieve states of deep relaxation – what Dr. Conrad calls the “opposite of Graves’ Disease” Dr. Conrad’s article makes two key points about autoimmune conditions like Graves’ disease. Secondly, stress is often a key precipitator in aggravating these conditions, and working to decrease or better manage stress can often balance immune system function and facilitate healing. It is good to be aware of all the options, both medical and lifestyle, when dealing with the Graves’ Disease challenge. Often, if the medical and lifestyle options can work in concert, the Graves’ Disease patients usually feel better, and continue to live productive, active lives. Susan Kime is a contributor to Women's Health. She has a PhD in clinical psychology.